The Ratway is a network of sewer tunnels running beneath Riften, and home to the Thieves Guild. There are three zones to the Ratway, namely The Ratway, The Ratway Vaults, and The Ratway Warrens. The entrance to the sewer is below The Scorched Hammer, and the nearest stairs down to the lower level of Riften are beside Honorhall Orphanage. The sewers can also be accessed through The Ragged Flagon, after joining the Thieves Guild. The Ratway is used by non members of The Thieves Guild to access The Ragged Flagon. Shadowfoot SanctumCC: Purchase a cozy sewer home ideal for a thief. The Silence Has Been Broken: Meet Amaund Motierre inside Volunruud and learn who he wants assassinated. Where You Hang Your Enemy's Head...: Restore the Dark Brotherhood's sanctuary. At the bottom of the steps from the main entrance there is a woodcutter's axe, past this there are two alcoves on the left, and in the first is a hanging moss growing through the grate in the floor. At the end of the tunnel there are two shady characters discussing their decision to move into the Ratway and attack anyone looking to pass. To the left of the campfire they are standing by is a small coin purse. Once past them is a square room with an unowned bedroll and a single piece of bread between bedroll and the right wall. On the floor opposite of bedroll from where you can see a raised bridge is an iron mace. The lever to lower the bridge is on the other side and it is not possible to get to it directly. You must drop down to the stone floor below, there is a skeever wandering about here. There is a darkened tunnel to the east that is blocked by an expert-locked gate or a lit tunnel heading west that leads to an apprentice-trapped wooden door. That triggers a spear trap from the left side which is easily avoided by simply stepping back. There is some bars to the northwest blocking a cave-in and a tunnel to the south with a pile of firewood to the left. The next room has an oil slick, with an oil lantern hanging above, just beside the door is another woodcutter's axe, and a pair of iron boots. Through the open door opposite is a small room containing a couple of sets of shelves holding a some bread and cheese, a seared slaughterfish steak, a bulb of garlic, and a single loose septim. There is also an unowned bed roll on the ground in the northern corner. The tunnel continues south starting with another single loose septim, through the door awaits Gian the Fist; he has a very high detection level, making it nearly impossible to sneak up to him (though if you make noise you'll not have to waite long before Lowlife runs towards to kill you, while Gian the Fist still sits in his room and wouldn't notice you engaging in combat unless it's happening right outside of his door). He wears the unique Gloves of the Pugilist. He sits at the far side of the room, beside his bedroll, just inside the door there are five bear traps. There is a cooking pot by the west wall, an unowned hay pile in the southwestern corner and four bottles of Nord mead laying on the ground. In an alcove to the east is a table with a built-in alchemy lab. Also on the table is a bottle of alto wine and a weak frenzy poison. Or you may find weak aversion to fire to your right next to the bottle of alto wine and malign aversion to fire on the floor to your left. The next room has nothing of value. On the third step from the top of the stairs, on the left-hand side, is a pressure plate that activates a battering ram from behind you. Through the locked grated door is a small naturally lit room with vegetation growing in the center including a blue mountain flower and roots hanging down from the ceiling all around the room. There is an executioner's block with an iron battleaxe driven into it and two hanging moss hanging down. The entrance to Shadowfoot Sanctum can be found behind a gate in this room if you have the Shadowfoot Sanctum Creation installed. Continuing through the next tunnel you will come upon the Lowlife who is facing away from you (and, apparently, if he/she notices you early enough, grabs that iron battle axe, deals with skeever in the very room and rush towards you even before you've jumped beneath raised bridge) and on the table a copy of the Pickpocket skill book Beggar, a loaf of bread, a salt pile and a drum. There are two tunnels to the north, the left-hand tunnel leads to the raised bridge seen previously from the other side and the associated lever. The right-hand one leads to the expert-locked grated door as seen previously. The door to the east leads to The Ragged Flagon. During the quest A Cornered Rat Shavari will be seen around town and waiting for you as soon as you enter the Ratway. The only way to get to the vaults is through The Ragged Flagon—the door is to the right of the bar. The door opens to a large three-floored room with the darkened path heading to the left, passing two small alcoves before exiting to the east into a tunnel. At the end of tunnel, where it enters a room there is a tripwire that triggers two swinging maces from the ceiling straight ahead. In the left-hand corner of the room is an unowned bed with a dead Nord lying on top. There is a campfire opposite the entrance, with three blocks of wood for seats, a food sack and three loaves of bread all beside it and three skeevers nearby. Through a wooden door is another tunnel heading south, by a barred window, on the right is a lit brazier, a chair, and leaning against the bars a random battleaxe. Above the brazier is a garlic braid and some dried frost mirriam. Following the path around the pillar and the next corner, there are two alcoves to the left. The second alcove has no floor and an oil lantern that can be knocked down onto an oil slick on the floor of the level below. The tunnel then turns west and at the end turns north and leads out into the first room, on the next level down. There is a Vagrant patrolling along the path. Completing the circle and continuing under the entrance. The passage continues into a room in darkness. In the room is an anvil, a workbench with a pair of random enchanted gauntlets, three iron ingots and a leather strip on top, and an unlocked chest in the dirt behind the anvil. There is a lit tunnel heading west, opposite the workbench with an iron helmet on the ground. The room after this is guarded by another Vagrant who uses a bow at the top of two flights of stairs and a Lowlife by a table at the bottom. The room contains a long wooden table and chairs in the middle of the room with a random enchanted war axe, three small coin purses and one large, six loose septims, a loaf of bread and two chests, both containing minor loot; one unlocked and the other apprentice-locked. Under the stairs, against the north wall are two sets of shelves holding a woodcutter's axe among a lot of clutter and a novice-locked chest to the right. Above this, painted on the wall is the "Loot" shadowmark. The chest contains Dravin's bow among its loot, a unique bow stolen from Dravin Llanith, the owner of Merryfair Farm just outside Riften to the north. He and his wife were recently robbed, speaking to him will initiate a quest to recover the bow from thieves in the Ratway. A short tunnel leads south from here, to an overgrown corner section of the tunnel that contains a skeever. The tunnel eventually opens up to the first room again, this time on the bottom floor. There is an open gate opposite and barred windows along the east wall. On the ground is a pickaxe, while against the north wall is a straw bale with a couple of food sacks beside it. Beyond the open gate appears to have a small oil slick with the oil lantern seen in the tunnel above, over it. 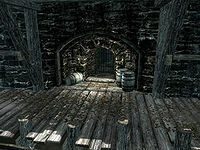 Against the south wall, behind more bars is a random Fortify Health potion on the ground and to the left is a short tunnel leading down a some stairs to a door that opens into the Ratway Warrens. During the A Cornered Rat quest, two Thalmor soldiers and a Thalmor wizard will be found in the Vaults, the wizard opposite the entrance with each of the guards on one of the floors below. You enter into a darkened tunnel with an apprentice-locked gate on your right and a lit room behind. At the end the tunnel turns west and at the end is a doorway into the same room. In front is a flight of stone stairs leading up to a ledge above, with a pickaxe on the ground at the bottom. On your right is some wooden scaffolding, while on the left is a straw bale and beyond that a wooden door. This opens into a small room containing Salvianus a mad, retired Imperial soldier who fought in the Great War. He is normally found sat on a chair eating bread. He rabbles, and doesn't seem to make much sense. There is an unowned bed roll on the ground and a wooden table at the rear of the room with two leveled potions; one of pickpocketing and the other light feet, an enchanted iron dagger, an Imperial officer's helmet and a red apple on top and an unlocked chest underneath. All of these items are marked as owned and taking them is considered stealing. To the right of the stairs, against the north wall is an apprentice-locked door. Behind which you can hear a female who also sound disturbed. Her name is Hefid the Deaf and she is sitting on the ground in the dark facing away from you. She is carrying several items including a burned book, a bucket, a flawless garnet, an inkwell, and an iron dagger. Which she constantly checks to ensure she hasn't lost any item. You may not be able to interact with her to pickpocket or even view the items. At the top of the stairs is an unlocked gate directly in front Behind which Knjakr, a mad chef will attack as soon as you approach declaring, "I'm going to eat well tonight, my darling!" implying he's a cannibal. His apparel consists of a chef's tunic, a chef's hat, and a pair of shoes. He is armed with an iron war axe. His room has partially caved-in, with an unowned bed roll, a table with a piece of random raw meat on top and a grindstone in the small area not covered with the earth. To the south is another small room containing an unowned single bed and empty table behind an unlocked gate. To the left is an area with a large square hole in the floor that drops down into Salvianus' room. At the end is a substantial door with many locks, bolts and chains. If you try and open it a small slot will open and a man will not welcome you and give threats. During A Cornered Rat, you discover this to be the door to Esbern's room. The room is very well stocked and decorated, certainly out of place for such a place as the Ratway. To the left of the door from the vaults back into The Ragged Flagon is a "Guild" shadowmark. During the A Cornered Rat quest, the only person seen in the warrens is Salvianus. Everyone else has disappeared. When you reach the heavily-locked door and go through the conversation, eventually Esbern will admit who he is and let you in. His room contains a single bed with a small table beside it with copies of The Dragon Break and The Rise and Fall of the Blades and a random enchanted dagger piled on top, a stack of crates beside this has a potion of health on top and at the foot of the bed is an unlocked chest. A dresser can be found opposite with rolls of paper on top, a woodcutter's axe is leaning against the west wall, with a desk along the same wall with a salt pile, a portion of grilled leeks, a bottle of Nord mead, the One-handed skill book Fire and Darkness and several common books on top and piled on the floor beside it, and a bookcase behind the desk holds a further eleven common books, as well as copies of Magic from the Sky, The Dragon War, Feyfolken III, Children of the Sky and The Wolf Queen, v6, a bottle of Nord mead, a silver jeweled necklace and ten gold coins. There is a small set of shelves against the south wall with four more common books, two red apples and a loaf of bread. There is an end table beside the door with a common book and a copy of Lost Legends on top, a cooking pot in the corner beside it and a counter that continues around to the south wall with a raw rabbit leg, two charred skeever hides, two skeever tails, a gourd, a blue butterfly wing, two random potions, a bottle of alto wine and a bottle of Nord mead on top and on the shelves underneath, while hanging above are two whole salmon, two garlic braids, a bunch of dried elves ear and a bunch of dried frost mirriam. When you leave his room, or if you stay too long, while you are still there you will be attacked by another Thalmor soldier and wizard. The Ratway, the Ratway Vaults, and The Ragged Flagon never respawn. However, the Ratway Warrens respawn on a standard ten day schedule. During A Cornered Rat the only NPC that remains in the Ratway Vaults is the Nord who is alive, all the others are gone while a few Thalmor are added, the locations of which are on the quest page. A "Guild" shadowmark is on the left side of the ground before the gated door to The Ragged Flagon. It's marked for being the headquarters of the Thieves Guild. A "Loot" shadowmark is above the chest in the northwest room of the Ratway Vaults. A "Danger" shadowmark can be seen after going through Riftweald Manor and before dropping down into the Ratway Vaults. In Legends, there is a reference to the Ratway, with a card named Ratway Prospector. This page was last modified on 16 April 2019, at 15:46.